CBC receives $10K for scholarships from Uranium Energy Corp.
Photo Cutline: Uranium Energy Corp (UEC) representatives Craig Wall, far left, and Harry Anthony, far right, present Coastal Bend College with a $10,000 check to help support the Community Scholarship Program. Receiving the check on behalf of CBC are Benjamin Avila, UEC scholarship recipient and CBC drafting and design student, and Dr. Beatriz T. Espinoza, CBC President. UEC has provided support for 40 student scholarships since 2011. 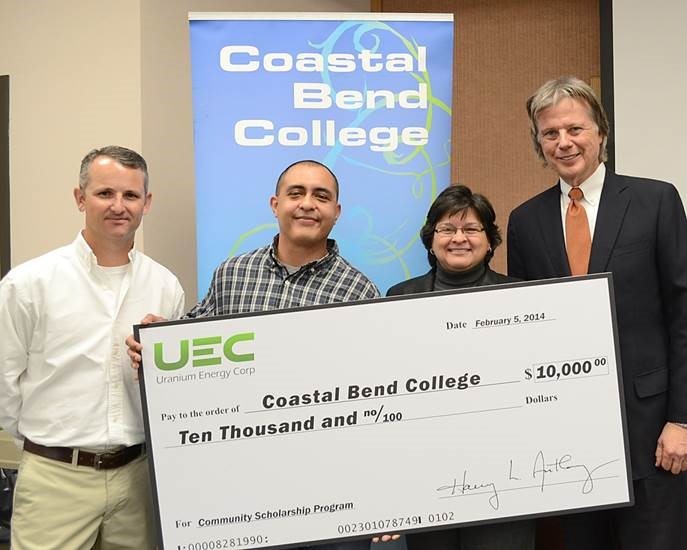 Uranium Energy Corp (UEC) donated $10,000 to Coastal Bend College (CBC) at a check presentation/reception on Wednesday, February 5. UEC has donated a combined total of $30,000 since 2011 as part of the Community Scholarship Program at CBC. The scholarship program provides higher education opportunities for students in Bee, Duval, Goliad, Jim Wells, Karnes, Live Oak and Nueces Counties who are pursuing academic, industrial trades, and engineering-related majors. Since 2011, CBC has awarded the scholarship to 40 students whose cumulative grade point average (GPA) is a 3.32. Of those 40 students, 19 have graduated with a level 1 or level 2 certificate, or an associate’s degree. Many of those students have graduated with all three. One of the students that has benefitted greatly from the scholarship is current CBC drafting and design student Benjamin Avila. He is in his second year of the CBC Drafting and Design Technology Program and has been on the Dean’s List because of his outstanding 3.64 GPA. Avila moved to the Beeville area from Waco to pursue a career in an Eagle Ford Shale related industry, but decided on attending CBC to obtain a solid educational foundation first at the urging of his sister. “I would like to emphasize how much the UEC scholarship has helped me out. I work as a cook at a local restaurant, and I’ve come to the realization that I cannot do that for the rest of my life. There was a period of time when the restaurant I work at was closed, and the UEC scholarship helped me pay for gas and supplies to keep coming to school. I’m graduating with my level 1 certificate this year, and I am already working towards my associate’s degree,” Avila said. Uranium Energy Corp is a Corpus Christi-based uranium production, development and exploration company whose operations are managed by professionals with a recognized profile for excellence in their industry, a profile based on many decades of hands-on experience. Uranium Energy Corp is an industry leader in meeting the world’s overwhelming demand for more uranium, for more energy, for cheaper energy and for a cleaner environment. For more information on Uranium Energy Corp, visit http://www.uraniumenergy.com. For more information about CBC scholarships, or to see how you can help support student success at CBC, please contact the Coastal Bend College Foundation at (361) 354-2348 or via email at foundation@coastalbend.edu.